Teaching Our Tomorrow: An Interview With IBA's Preschool Staff | IBA Boston | Inquilinos Boricuas en Acción empowers and engages individuals and families to improve their lives through high-quality affordable housing, education, and arts programs. Serving children ages 2.9-5.5, IBA’s year-round preschool was the first bilingual program in the state of Massachusetts and is one of the Massachusetts Top 21 School Readiness programs. 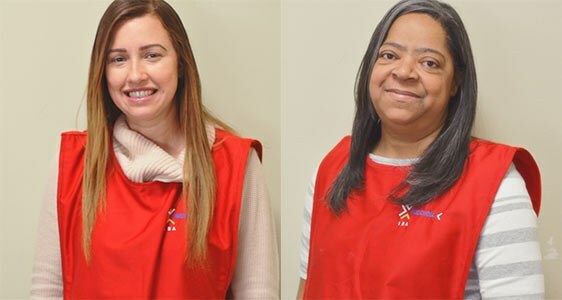 To learn more about IBA’s Preschool Program and the core values it instills in children, we sat down with Program Manager Joanna Fuentes, who has been with IBA for 19 years, and Education Manager Valerie Laboy, who has been on board for eight. Q: What has been the evolution of IBA’s preschool program over the years? Joanna: We’ve watched the growth and development of the children that have come through the program. Our preschool program accommodates up to 80 students, of which we currently have 67. We’ve witnessed how interested the parents are in sharing in their child’s education, and we’ve seen the evolution of the communication between both parent and student and parent and teacher. We’ve also seen various cultures within the program, and we work to integrate the cultures together here. Valerie: We have also grown quite a bit in terms of the quality of education. In the Childcare Quality Rating System (QRS) we have moved from a level one to a level three. This is a triumph for us because our program has been able to achieve a level three, offering to children wonderful quality of education, security, and a great service to parents. Joanna: We also have all of our licenses and accreditations (like EEC and NAEYC), meaning we are a completely full-service program! Q: Do you feel that the need for a bilingual program like the one IBA offers has grown over the years? Valerie: Yes! We’ve noticed that other similar programs have sprung up around us. IBA’s was the first bilingual preschool program in Massachusetts. There are a lot of Latinos in Boston; many have immigrated from Puerto Rico and other places and their children arrive not speaking English. It’s wonderful to have a place where they can have a part of their culture and language… that Hispanic touch! Also the food, because everything we do has to do with teaching—even snack time! Joanna: We’ve also noticed that other parents that only speak English are interested in their children learning a second language. We’re making a huge difference! Valerie: Cognitively, it’s amazing for kids to speak two languages. It expands their minds. Q: Tell me a little bit about the curriculum. Valerie: We use a creative curriculum. Meaning, while the child is playing, we introduce academic lessons and principles in a natural way so that the child learns in an intuitive manner. This stimulates the development of reasoning skills instead of focusing on memorization. Joanna: We also work on socialization, emotional awareness, and development of fine and gross motor skills as they play, run, jump, and move. Q: Outside of the curriculum you’ve described, what else do you focus on? Valerie: We focus quite a bit on social interactions; we want kids to learn to care about one another. We live in a world where there is a lot of division, a lot of problems. We want the kids to learn to help each other, to respect each other, and to value each other’s feelings. During our “social play” time, teachers help the kids and guide them to share and wait their turn, preparing them for the future by building up those social skills. We also provide sensory experiences for the children and expose them to opera, classical music concerts, and puppet shows which enrich their experience. Joanna: And we do special events, talent shows, family picnics and other types of activities where we can integrate parents and families, so they can get to know each other and share ideas with us and each other. Q: Parents speak highly of the constant communication with the school. What is the importance of that type of communication plan? Valerie: Each parent knows what their child has in their heart and what they want them to develop. Good communication between parent and teacher is to help each child grow and develop to their fullest potential in all areas. The teacher can learn what parents’ concerns are, what the needs are, and what their individual story and home customs are. With this, the teacher can develop a personalized learning plan for each child, so that communication is crucial. Q: Can you tell me your personal journey into early childhood education? Valerie: I worked in Bible school in a church and realized I had a gift for working with children. I paid the children a lot of care and attention, and every time I walked in, they would run towards me! I noticed within me a growing desire to be able to help and teach children, and an opportunity arose at a school in Puerto Rico to be a teacher. I loved it and then ended up here! Joanna: I always wanted to be a teacher because I believe that being a teacher is an art. It’s to contribute to a brighter future! As a preschool, we give them an important base to begin building that better future. Q: How do you view the future of preschool education? Joanna: It’s big! Every day the future of preschool education grows and develops. Our program is the part of the first dozen or so of its kind in Massachusetts. I see growth upon growth! Valerie: I see that we will continue to focus on increasing the quality of education. This includes investing in teachers, giving them training and helping them meet their individual needs. We are a family, and we take care of each other. If a teacher feels good and supported, that will project to the kids! By helping each other face to face and helping teachers excel in their professional development, the quality of preschool education will only continue to improve.